﻿ It’s utterly baffling that Escape The Fate are still around, especially seeing as they’ve produced nothing of quality in the longest time. What’s more, there’s nothing even about that’s necessarily worth paying attention to, or that really pops out beyond the usual scenecore pop-metal fluff. For as deplorable a human being as Ronnie Radke is, at least Falling In Reverse have colour and controversy as a boon; Escape The Fate comparably come across as so benign and white-bread that it’s difficult to understand why anyone has even paid attention for this long. Still, as with any band, there’s always an opportunity for improvement, so perhaps six albums in, I Am Human will be Escape The Fate’s chance to reverse their fortunes and move away from their flailing track record. Now they’re some pretty specious claims in all honesty, and even with an immediate lack of optimism, I Am Human still manage to sink further into Escape The Fate’s ever-widening swamp of awfulness as another lazy, uncreative “effort” that, by all rights, more people should be picking up on by now. 2015’s Hate Me might have been terrible too, but if anything, I Am Human doubles down on all the derivative, redundant traits of that album, beating this dead horse even deeper into the ground. The worst thing is this isn’t even surprising anymore, just disappointingly par for the course – Escape The Fate come out with a new album every two or three years that’ll sate a young, devoted fanbase despite being horrendous in almost every conceivable way. And ultimately, it’s difficult to know where to even start here, seeing as I Am Human is, for all intents and purposes, the same album as its predecessor. Of course, this is most prominent in the content, with Escape The Fate yet again opting to recycle the same handful of clichés that were drained of all vitality long ago, and broadly relatable enough for even the youngest listener they’ve suckered in to think it’s speaking directly to them. Thus, we get another execrable collection of songs centred around wallowing over a breakup, the edgy darkness within, and who could possibly forget being an outcast, eh? “I am weird, I’m a freak / I am different, I’m unique” sings Craig Mabbitt on the title track, with the sort of unctuous, overwrought delivery that only the most gullible of pre-teens would sympathise with, and would rightly instigate uncontrollable dry-heaving in literally everyone else. If this was the only example there’d by plenty wrong right here, but this is the sort of basic pandering that I Am Human is exclusively, all with a hefty dose of saccharine glazed on top for that extra crossover “appeal”. Recipe For Disaster and Digging My Own Grave try to be so dark and transgressive but end up so laughably terrible, while Bleed For Me and If Only feel like stock ballads with zero original spin put on them, even in the latter’s attempt at framing a song about the loss of a loved one as a jaunty acoustic number. Get to the obligatory “hedonistic rockstar” tracks of Empire and Riot, and they feel so thin and flimsy that the total lack of tonal consistency with everything else becomes the least of their problems. Don’t go thinking that the abject lack of ingenuity ends there though, because instrumentally, Escape The Fate are as creatively bankrupt as they’ve always been, so much so that they’ve even resorted to openly ripping off other songs; Broken Heart and I Will Make It Up To You are shameless copies of Papa Roach’s Help and My Chemical Romance’s I’m Not Okay respectively, presumably hoping to osmose even an iota of the energy and strength either of those songs had. The problem, though, is that Escape The Fate just cannot muster anything of the sort, and I Am Human is reduced to their usually flaccid pop-metal once again. Resistance‘s central riff might be decent (almost as good as when Muse had the same one on Uprising, as a matter of fact), but that’s the extent of the praise that can be awarded here. Elsewhere, songs like Beautifully Tragic and Do You Love Me find their intended metallic impact severely dulled by their impenetrable layer of gloss, and pretty much every instance of a flashy solo feels as though it’s been called upon to lend some vestige of reputability to their basic, lazy sound. But to see the real peak of Escape The Fate’s laziness, the track that needs to be brought into closest contention is the closer Let Me Be. On its own, it’s definitely not a good song, a twee, offensively inoffensive folk-pop number that has no business being here, but that’s also because it also featured as the closer on their last album. This is how much this band care about you, Escape The Fate fans, enough to reuse older material for no good reason other than to siphon any remaining pennies from anyone who’s stupid enough to allow them to. Sticking so closely to your derivative formula again is bad enough, but brazenly throwing in previously-released material with no explanation feels like such a scumbag move. If this album was forty-five minutes of Craig Mabbitt outlining his newly-devised pyramid scheme, it would only be marginally more of a scam than it already is, another useless waste of time and energy from a band who haven’t been relevant in years and who haven’t released decent material in twice as long. If I Am Human isn’t the final straw for this sorry excuse for a band, something is dreadfully wrong and needs to be dealt with immediately, because there’s no way that stuff like this can continue to be released. 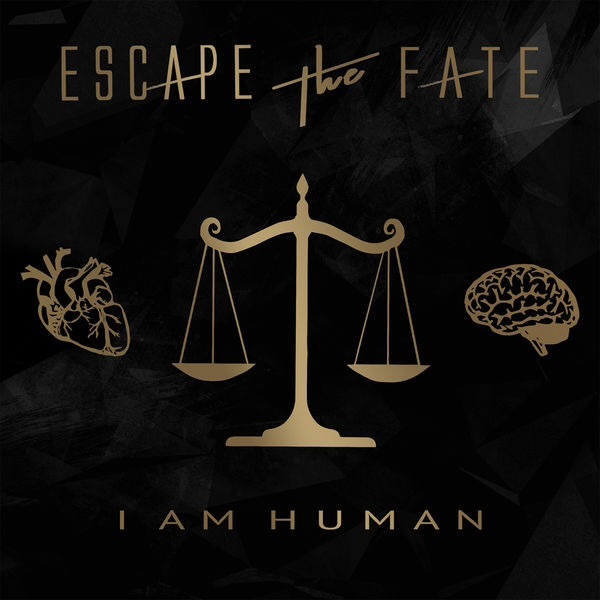 ‘I Am Human’ by Escape The Fate is released on 30th March on Better Noise Records.